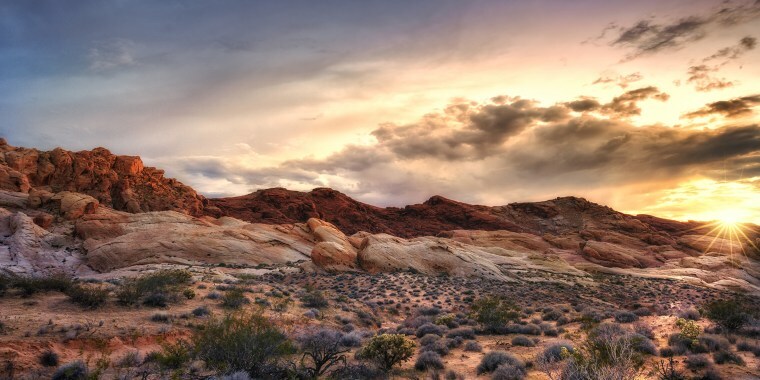 The Mojave Desert's technicolor rock formations, canyons and cliffs are even more mesmerizing than the non-stop glitz and glitter of the Las Vegas Strip. It's the best of both worlds: An adventurous vacation with beautiful scenery mixed with the convenient, affordable flights that serve Sin City. If the mercury is high, you can still get a feel for the landscape on the 13-mile Scenic Loop Drive, which is peppered with turn-offs that offer fantastic photo-ops. (Note that there are no water stops or restrooms on the loop, so plan accordingly before you head out.) Feel like tackling a hike? Pull off at the trailhead for the Keystone Thrust Fault, which is the area's most important rock formation. The contrasting older grey limestone and newer red sandstone perfectly illustrate how, some 65 million years ago, the earth's crustal plates collided, pushing the older rock up and over the younger one. To see 800-year–old Native American inscriptions, stop at the Willow Spring Picnic Area and follow signs for the Petroglyph Wall Trail trailhead (it's a short, easy walk). Once you've marveled at the forces of nature, it's time to get impressed by human ingenuity at the Hoover Dam, about an hour west of the Red Rock Canyon area. Only kids ages 8 and up are permitted on the hour-long tours, but you can still explore the area on and around the dam. Slightly to the south, the arch-shaped Mike O'Callaghan–Pat Tillman Memorial Bridge offers an excellent perspective as well (stop here early in the day, as the parking area is small and tends to fill up). When your kids have had their fill of hiking and science, take refuge from the desert heat at the Wet'n'Wild Water Park Las Vegas: Younger kids will love the wave pool and lazy river, while the older ones can swoosh down slides like the Constrictor (lots of tight turns) and the Hoover Half Pipe (you slide down, then halfway up another section, then down again). Bonnie Springs Ranch, the only accommodations within the canyon's conservation area, puts a kitschy spin on its Wild West history. (The ranch was founded in 1843 as a wagon train stop for pioneers en route to California.) Along with a 50-room motel and swimming pool, the property is home to a barbecue restaurant, zoo, horseback riding stable and Old Town, a recreation of an 1880s mining outpost, complete with staged gunfights and other shows. Vegas is known its posh hotel digs, and the Red Rock Casino Resort & Spa brings that sensibility to the city's outskirts. Even the basic double queen rooms, which overlook either The Strip or the red rocks, are at least 500 square feet and have silky Egyptian linens and sizable bathrooms with deep soaking tubs. The Cracked Egg, a popular Vegas mini chain, has a location just west of the Red Rock Conservation Area. It's known for serving crowd-pleasing breakfast and brunch dishes like skillets, which are carefully layered dishes of eggs, seasoned potatoes and cheese, plus add-ons like chili, vegetables, chorizo and ground beef. For something fancier, Red Rock Casino Resort's Hearthstone Kitchen & Cellar is headed by Brian Massie, who's overseen restaurants at The Bellagio and Mandalay Bay. Kids will love the chance to create their own pizzas, while adults can choose ingeniously crafted dishes like housemade sausage with roasted apple and pork, or braised veal breast ravioli with spring peas.